• Horse toys. Yes, toys. Horse toys are great boredom busters, and can be a great way for your horse to enjoy some treats. 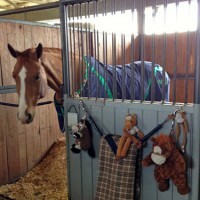 Simple teddy bears or stuffed horses are often a great gift for the horse that is social. Bringing the toy along in the trailer or having him at the show can also calm an anxious horse. Just be sure he doesn’t want to eat his new buddy! Other treats are more interactive, and usually have some sort of treat dispensing mechanism. These toys are great for the horse that thinks the barn is his own personal puzzle to be dismantled one bolt at a time. It’s also great fun for you to see him figure these types of toys out! • Massage. If you spring for a massage by an equine body worker, your horse will droopy-lip and closed-eye thank you, I promise. If that’s not an option for you, spending extra time with the curry comb or his grooming tool of choice will be just as satisfying for your horse. You know his “sweet spots;” spend extra time scratching those areas. He’ll appreciate it! • Time. For many of us, our beloved horse is squeezed in between jobs, spouses, soccer games, and chores. Ever wonder what your guy is up to in the morning? What about lunch? Have you ever gotten the chance to just sit on the fence and watch him during turn out? Take a few hours off and hang with your buddy. Spend time, go hand grazing, and bring your camera. It’s a win-win for both of you, plus, you won’t be at work. • Monograms. Even if your horse can’t read, monogramming his blanket is a great holiday gift for you and your horse. It’s a great way to spiff up your show blankets, and it just plain looks nice. Adding a major accomplishment under your horse’s name is a great way to brag about how awesome he is, also! Even if your horse has never actually completed a course at a show without “airs above the ground,” monograms are nice. Picture it now: “Comet : Loves to buck in front of the judge” as a hip monogram on his turn-out rug. All of the other horses will be jealous! • Extra-long turn-out or hand grazing. While hand grazing isn’t an adrenaline rush (or, sometimes it can be! ), our horses love it! It’s great bonding time, helps your horse stay healthy and happy, and is a great chance for photos. If you get too bored, you can upload all of those photos to social media to remind all of your horse friends that your horse is the most photogenic. • Peppermints. Just for grins, see if your horse likes candy canes! Yes, it’s a sugary treat to be given in moderation, but it’s also the holidays and most horses go bonkers for peppermint. Of course, you may create a peppermint-loving fiend who demands mints all year long, so be prepared to stock up! • Extra bedding. You know the routine of almost every horse on the planet: clean stall, close door, your horse poops. Another popular routine: add shavings, roll. This is your chance to make his rolling dreams come true by adding a ridiculous amount of fresh shavings to his house and watch him wallow. • Home-made treats. These are easy to do! My favorite recipe combines grated carrots, grated apples, molasses, and oats. Mix, bake, and cool. These are always an experiment in terms of baking time depending on how much of each ingredient I add, but even the overdone ones are good. • New cooler. Coolers are the most versatile and affordable blankets to have around. You don’t necessarily want to use a cooler as a blanket, but they can help you as you warm up, cool down, for those days where you need to cut the wind or chill in the air just a little bit. They can also be used as a blanket liner in a pinch. Perhaps the best part of coolers is the massive array of colors that are available, so if you want your stallion to wear a pink polka dotted blanket, he can. • Updated brass or silver tack tags and name tags. Just in case your horse is prone to having an identity crisis, engraved plaques with your horse’s name are fun to have around. Halters, bridles, stall doors, even your keychain needs a name plaque or tag. This is also great for large boarding barns, just in case your stuff tends to grow legs and walk away. Whatever your budget is this year, you can give your horse a great holiday present. And, it’s a great excuse to escape all of the holiday rush by going to the barn!